If you're passionate about starting a business in fashion, you've no doubt thought about the possibility of owning your own boutique. Shopping for women's clothing in designer outlets can be exciting and fun, and so you might assume it's bound to attract customers, but in reality running your own clothes store can be very hard work and doing it successfully requires sound business planning. The riskiest part of starting a business in clothes retail is finding the right premises. If you start spending too much on rent you won't be able to sustain your business overheads, prices will be forced up and customers will start going elsewhere. On the other hand, if you set up your shop somewhere too obscure, potential customers won't know where to find you and you'll miss out on casual custom. This is less of a problem for niche designers, but can hit mainstream fashion outlets hard. It's unlikely that you'll be able to find premises suitable for running your boutique directly alongside your fashion design business, so you'll need to supervise staff or liaise with colleagues at one location whilst you work in another. This will require strong organisation and well established working systems. For this reason, it's advisable to get the design side of your business up and running properly before you try setting up a shop. Owning a clothes shop gives you a great opportunity to promote and sell your fashion design, but even the most famous designer boutiques rarely stock the work of just one individual or company. A successful clothes shop usually has to sell a range of products, including accessories, which is too wide for one designer to cover. You will therefore need to sell some clothes produced by other people alongside your own, though of course you can give yours prime position. Selling other people's designs isn't such a bad thing. You'll still get a commission and it can help you to forge valuable connections within the fashion industry. What's more, it can actually increase your prestige, especially if you present yourself as a leading designer and the other people whose work you're selling as your discoveries. Trade shows are a great place to meet other designers and look for clothes you might want to sell. You can also look at other people's designs on the internet. Try to choose clothes which will attract the same customers as your own designs but which are sufficiently different in style to make yours stand out. 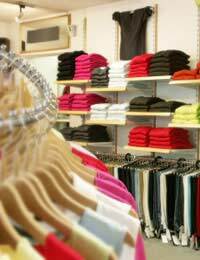 Remember that you will need to charge more for your clothes once you're selling them in a shop, as you'll have extra overheads to meet. Furthermore, you won't want your clothes to look cheap next to other people's. One of the best things about running a boutique, from a designer's perspective, is that it's highly visible. Make sure you use the same name for your shop as for your design business, and make sure it's easy to read. Make your logo visible both inside and outside the shop. If possible, decorate the shop using themes related to the signature colours which you use for advertising. Keep copies of your catalogue handy to provide to customers who purchase your designs. As a physically visible business, your shop will much easier to promote to customers than your design business. However, you should be cautious about the techniques you use to draw potential customers in. At first, shoppers will be interested simply because you're new. Be friendly and let them see your very best work. When this initial rush of interest fades, don't be tempted to lure people back with a succession of sales. These will make you look as if your designs aren't worth paying full price for. A better way to retrieve shoppers' attention is to change window displays dramatically and announce the arrival of a new collection. Don't forget that window displays need not be limited to clothing. You can use any items you want to create an image your target customers will identify with. Running a shop is hard work, and doing it alongside running a fashion design business can be exhausting, but if you have dedicated colleagues to share the burden then cross-promotion between the two parts of your business can have considerable benefits for both. This page has been informative and helpful on how to start a fashion business to me being a potential investor in fashion business.